Router tables depending if you think about buying or making your own, you should take at least some basic planning into your project. 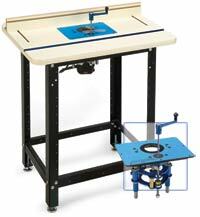 Being one of the most versatile tools in a workshop, a router table must have certain features. Lets start with some basic principles before looking into details. A routing table fixes your plunge or fixed base router underneath a table. Instead of moving the router over the workpiece, you move the wood "over" the router. The wood is guided along the table by a guide fence. At the opening of the guide fence the wood is cut and the dust and chips are extracted by a opening at the back of the guide fence. The router can still be moved vertically within the table in order to adapt depth of cut. Key parts are the table top quality, fence, positioning of router within the table, stability of the table and safety switch. 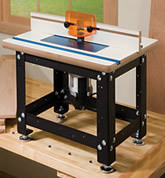 Movable from back to front, the router table fence guides you along the cut. The guide fence supporting system should be connected to your vac to keep the working area dust free. On top of the guide fence support are usually two boards mounted. The gap between the two boards leaves enough room for the router bit to move freely, but should be as close as possible to prevent splintering. Some suppliers offer special insert pieces to keep the gap between the two fence boards closed. On shop made tables you can simply add a large splinter board along the entire fence and cut it out with your cutter. Adjustment and positioning of the router: Whatever router you use (fixed base or plunge) your router must be fit solid underneath the table. Most manufacturer offer special adaptors for most routers available. If you go for a shop made table, make sure the base of your router is attached securely. In addition it is very important that your router can be accessed easily from underneath or top of the table to quickly change your router bit. Fine adjustment: Height adjustment of you router is also a key factor to usability. Owning an old Elu (now De Walt) plunge router, I got myself a nice depth fine adjustment which works very well underneath my table. So if your router does not already have one, check with your router manufacturer. Stability: It sounds logical to look for a stable table design. However most cheap designs are not very solid and might need additional fixation. If you think about making your own table, you should consider including a "cabinet type" stand. Depending on your needs and available workspace, it's your decision which type will fit your needs best. Consider the standalone router table even if you have not much workspace available, because you could use some of the extra storage space in the stand of your table for additional woodworking tools. Large 19-3/4" x 16-3/4" machined aluminum table with cast-in lip to support extensions, 3/4" miter gauge slot, Multiple starting pin locations, Quick adjust split fence design with independently adjustable halves, Large 3-5/8" table hole size allows use of 3-1/2" diameter router bits, 20 amp lockable key-type switch, Dust collection hood sized for 2-1/2" hose, 12-7/8" leg height allows use of 1-1/2 to 3-1/4 HP Routers. Compact 16'' Deep x 21'' Wide x 16'' High in size, this system features a solid wood leg set, anodized aluminum fence, MDF fence faces, safety bit guard, center MDF insert and miter track. The table is 1'' thick MDF surfaced with Melamine. The custom plate leveling system makes it easy to perfectly level the insert plate with the tabletop. The table is predrilled for Porter Cable 690 and 890 Series routers. Also fits Makita 1100-1101 series, Bosch 1617-1618 and De Walt DW616 and DW618 (router is not included). Further product details here. 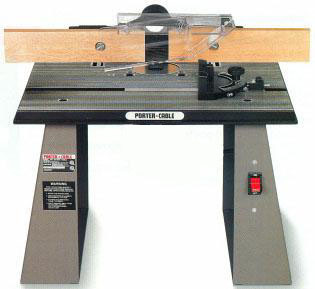 Router tables are one of the most versatile woodworking tools in your workshop. Whether you go for a bought or shop made table, make sure you understand all safety aspects of your router and how to handle a router. If equipped properly and with all possible safety features, a router table will be an indispensable piece of woodworking machinery.